Welcome to Comics THORsday! This time is a rather surprising topic for me: comic literacy, learning to read comics. Time ago I was approached by one of my friends who does not read comics. He said to me that he would love to, but he had no idea of how it worked. He left me speechless. I’ve been reading all types of comics since I was a kid, so, in my mind there was no way there would be people out there who would have problems in reading comics. I was blown away. I decided to help him read a comic and found out that he wasn’t joking. He was unable to follow the panels. Once I told him how to do it more or less, he started to navigate the pages of Loki Agent of Asgard #1 (the comic I had at the moment). He told me that thanks to my explanation things started to make sense. Till then, for him, comics had been mumbo jumbo. However, he also told me that he would need time and lots of read comics to feel comfy while reading a comic. On the bright side: he now can read comics. When someone tells you that they don’t read comics, one must now think about the possibility of them being unable to follow the panels and speech balloons. If you are new to reading comics, follow reading because I have some examples for you that might help you. Don’t despair nor get nervous. Reading comics, it’s fun! And it’s not difficult at all! As a general rule, Western comics are read from left to right, from top to bottom. If you’re dealing with a Japanese printed manga, even if it’s in English, but follows the Japanese reading way, the reading direction changes from right to left. The short guide here is only for Western comics. I chose Marvel Superhero ones to make my point. You can find panels without any speech. These are easy to follow. You just need to rest your eyes on them. Notice the colors and the environment, because drawings are giving you lots of information as well. Comics is a medium where written words and images are giving you information. Spaces between panels are there to let your imagination free. Those spaces are called gutter. 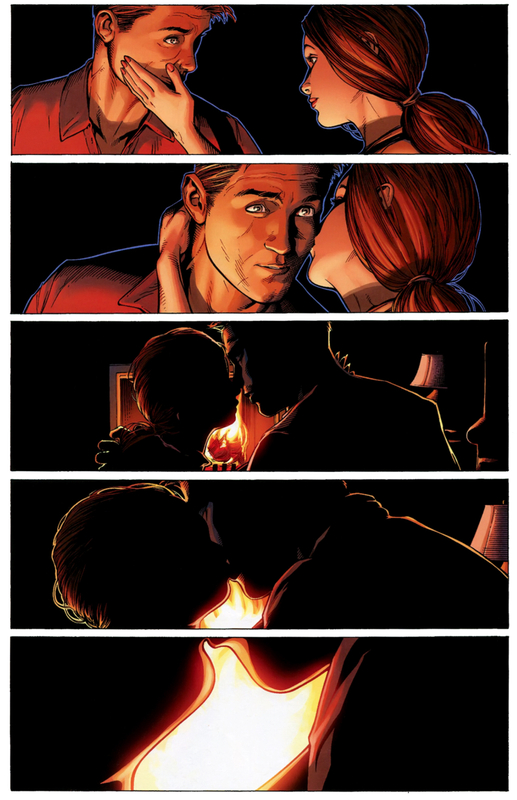 (c) Marvel, Guardians of the Galaxy #1, 2013. Click on the image to see it larger. 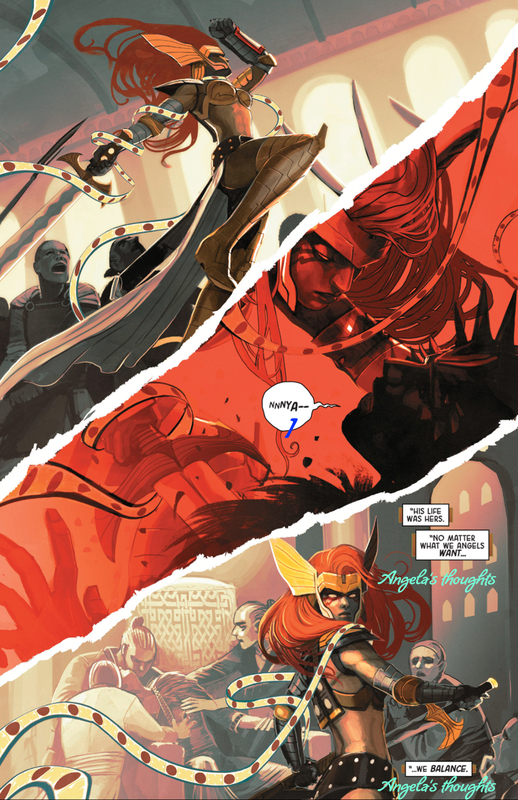 (C) Marvel, Angela, Asgard;s Assassin #1, 2015. Click on the image to see it larger. Pages can be more complicated and dynamic. 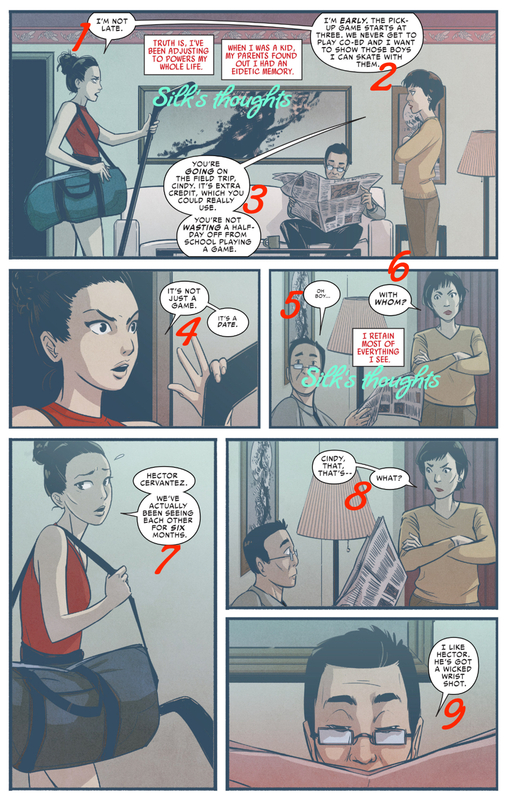 In this page of Silk #1 (2015), we can see Silk talking to her parents. She is arriving late somewhere, and she is having a discussion with her mother. Here the dynamics run between the conversation of the three and Silk’s thoughts. Silk’s thoughts are within captions. These are thoughts, explanations to the reader, and happen while she is talking to her family. Speech balloons have these pointers that go from them to the character. They point out who is talking. Again, you read the page from left to right, going top and then the bottom. (C) Marvel, Silk #1, 2015. Click on the image to see it larger. Yes, things can get a little bit complicated. Like the dialog between Black Widow and Hawkeye. They’re discussing, and from Clint’s behavior we know that it’s not the first time he messes things up. The dialog is quick, and we have the typical “I know (but I’m not really listening to you)” from Clint. Now, how do we read this? Following the balloons and the pointers. Too many pointers would look hideous, so the balloons are stuck together leaving some space. From left to right we find out who is talking first. And then, something interrupts them: Loki saying hello while falling from the building. Then we get Black Widow, and Hawkeye surprised, but Hawkeye goes quickly to fetch something. The white caption here explains what’s the weapon Hawkeye intends to use. On the last panel, we can find the sound of the crashing window written in letters, and Loki’s thoughts in a green caption. And if you read carefully, Loki is just talking to the reader. (C) Marvel, Loki Agent of Asgard #1. Click on the image to see it larger. We can find speed and action into the next page of Loki Agent of Asgard #10. 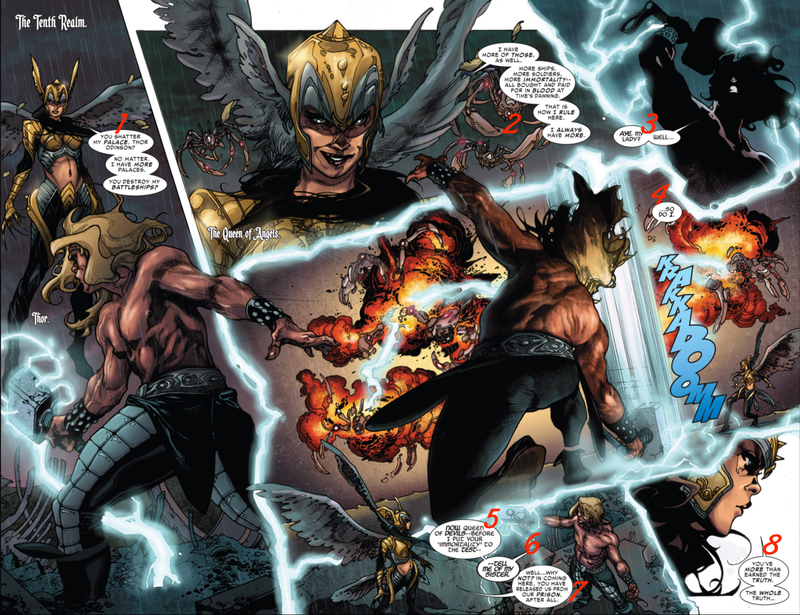 Thor is mad at Loki, and Verity, Loki’s friend, is trying to make the fight stop. While Thor is talking, she tries to stop him. In the last panel, we can see a balloon that it’s mixed with an exclamation balloon. By the time you arrive there, you know perfectly who screams STOP. 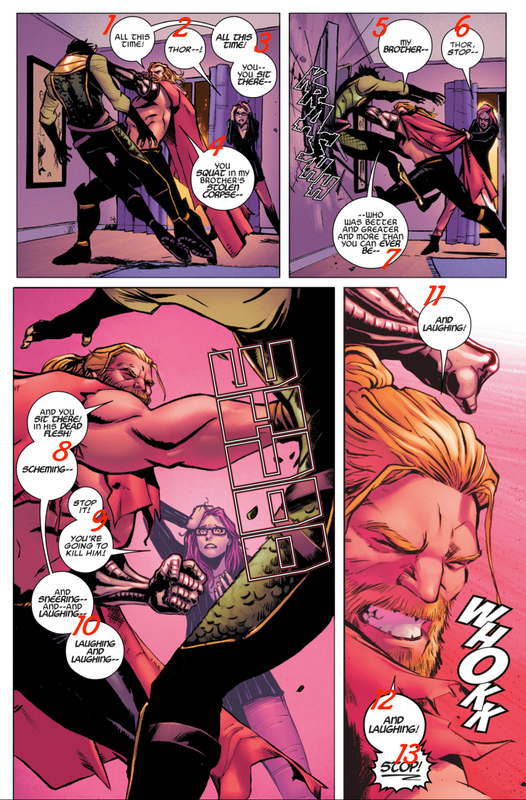 (C) Marvel, Loki Agent of Asgard #10. Click on the image to see it larger. Sometimes we can find two pages connected. These are called spreads and are read like a regular page, only that the action is contained in two pages. This one is pretty easy, from left to right, top to bottom, and following balloons and pointers we can easily read the spread. 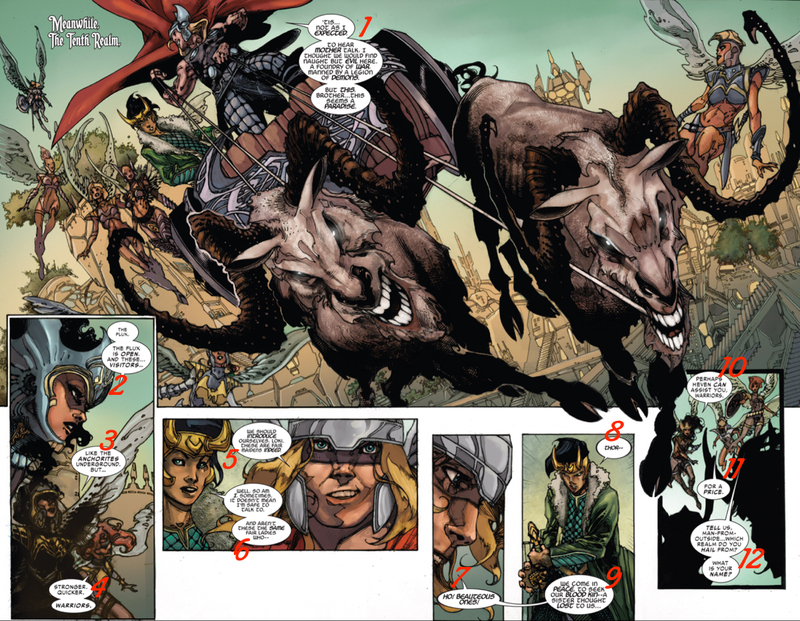 (C) Marvel, Original Sin: Thor & Loki, the Tenth Realm. Click on the image to see it larger. But some spreads can be challenging. Like this one. Panels here have a very strange gutter: Thor’s Hammer’s lighting. This is a very tense spread. And a challenging one to read. You can read it following the numbers I propose below, or you can stop by and taking a closer look at it, first reading the panels of the edges, and keeping the ones enclosed into the hammer’s lighting last. You will notice that if you do that, the meaning of the spread changes! Read them first like proposed below, then read the edges outside Mjolnir’s energy gutters, and then the ones within it. Which one do you think fits best? At this point, which one do you prefer? I would take the second way to read this spread, but you can take the linear one I propose. This means that comics are not like novels. You won’t always need to follow the rules. Sometimes, artists create something that breaks them and give you the opportunity to explore and decide what you like most. 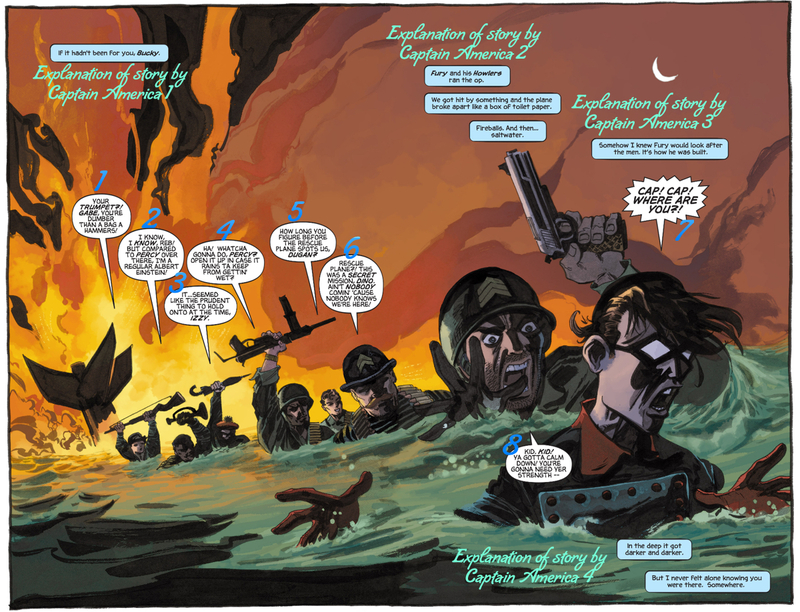 And our last example is a spread from Captain America White. The narrator is in captions, in blue. You read them first and know better what’s going on. Then, you can read the other elements of the page. The last thing you’ll read, are the bottom captions of Captain America. (C) Marvel, Captain America White #2, 2015. Click on the image to see it larger. As you can see, comics are pretty easy to read, they only need some time. Granted that when you are not used to them it’s quite difficult. But, with some practice you can read as many comics as you want without getting overwhelmed with all the elements that you can find on every single page. Remember, however, that the rule left-right, top-bottom is the one to follow, but it can be smashed by certain elements within the page. The art in comics can change the rules somehow. That’s the beauty of it. Are you ready to begin the adventure of reading comics? Scott McCloud, “Understanding Comics, the Invisible Art,” William Morrow Paperbacks 1994. Randy Duncan & Matthew J.Smith, “The Power of Comics. History, Form and Culture,” Bloomsbury, 2015. Copyright: Images on this post (C) depepi.com (C) Marvel / Memes (C) by their owners.